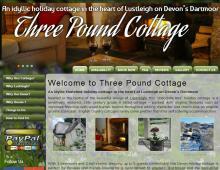 Three Pound Cottage is a pretty Dartmoor holiday cottage providing self catering accommodation in Lustleigh. The thatched holiday cottage, Dartmoor, is located in the heart of Lustleigh which boasts a traditional thatched country pub, tea room and children’s play park. This Devon self catering accommodation, Lustleigh comprises of 3 bedrooms, 2 bathrooms, wood-burner and many more original features. An idyllic holiday home on Dartmoor providing comfortable accommodation for up to 5 people, perfect for family holidays or breaks with friends. Three Pound Cottage, holiday rental Lustleigh, is a grade II listed building and one of the most popular Dartmoor holiday rentals in the area. If you are looking for a cottage that provides facilities for self catering, dartmoor national park accommodation or a Devon holiday home rental that you can explore the beaches or the countryside from, book Three Pound Cottage – a truly picturesque thatched holiday cottage in Lustleigh. For more information on this fantastic self catering accommodation, Dartmoor, contact Three Pound Cottage.